Sparkling wine of Riesling type. On Monday, July 28, 2003, a canadian trademark registration was filed for the above pictured logo by LIDL STIFTUNG & CO. KG Stiftsbergstr. 1, 74172 Neckarsulm, GERMANY . The Canadian IP office has given the trademark application number of 1185829. The current status of this trademark filing is Registration published. The correspondent listed for is ROBIC of 630, boul. René-Lévesque Ouest, 20e étage, Montréal, QUÉBEC, CANADA H3B1S6 The trademark is filed in the description of Sparkling wine of Riesling type. .
Mark Disclaimer: The right to the exclusive use of the word RIESLING is disclaimed apart from the trade-mark. (6) Labels, collarettes (bottle-neck labels) -- Note: Not including tie-on labels (20.5.15). 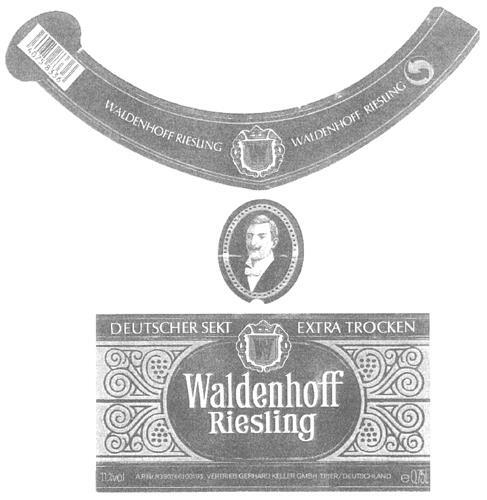 (1) - Sparkling wine of Riesling type.